⇓ Continue scrolling down to register. You may use the drop down list or the agenda style calendar. Inclusionary Zoning Program Participants – Please note: The 2-hour Pre-Purchase Orientations listed below do not by themselves meet the requirements of the DC Inclusionary Zoning Program for home buyers. Individuals who wish to participate in the Inclusionary Zoning (IZ) Program should register through the DC Department of Housing and Community Development’s (DHCD) Inclusionary Zoning web page at DHCD.DC.ORG. In order to register you will first need to determine if you are applying for IZ rental or IZ homeownership and participate in the required training. * IZ RENTAL UNITS: In order to be registered for IZ RENTAL properties you must provide proof that you participated in an Inclusionary Zoning Orientation (IZO). * IZ PURCHASE UNITS: If you wish to register to PURCHASE an IZ property, DHCD requires that you provide verification that you have attended an Inclusionary Zoning Orientation (IZO) AND that you graduated from an 8-hour Home Buyer Education Course by a DHCD approved community based organization. To participate in an Inclusionary Zoning Orientation (IZO) conducted by HCS: please sign up on this website or by calling 202-667-7606 to reserve a seat in an open IZO. Please bring a government issued picture ID. Seats are limited and walk-ins are accepted only when seats become available. You either have applied for DHCD’s Home Purchase Assistance Program (HPAP) and have received your HPAP Notification of Eligibility (NOE). NOTE: If you have not yet applied for HPAP but intend to use HPAP funds to purchase a home, you should start this process BEFORE moving forward on IZ. You have a pre-qualification letter from a lender that is less than 60 days old and that provides you with a loan qualification that meets the minimum purchase price of an IZ unit based on your household size and income (Click Here for most recent IZ purchase price schedule). In order to move forward in applying for HPAP or preparing for a pre-qualification letter from a private lender, we suggest that you start by attending an HCS Pre-Purchase Orientation (PPO). At the PPO we will explain how to determine if you are ready to buy, how to begin the purchase process and how to apply for HPAP. You may register to attend a PPO on this website or by calling the HCS Training Department at 202-667-7606. If you have questions or if you want to reserve a seat for the IZO, PPO or the 8-hour Home Buyer Education Course, please call the HCS Training Department at 202-667-7606. • Reserve Your Seat: A recent reduction in our budget from DHCD has resulted in us holding fewer workshops, some of which were already in high demand. Registration for some workshops fill very quickly. There is limited seating available, therefore it’s important that you reserve your seat through this website or by phone (202-667-7606) in advance of any workshop or clinic you would like to attend. Please arrive on time as your reserved seat WILL NOT be held after the start time for the event even if you have pre-registered and have a ticket. Please be aware that your registration ticket expires at the start time for the event and any open seats will be immediately distributed to walk-ins at the start time of the event. Please be aware that reservations expire at the start time for our events and your seat will not be held after the start time. PLEASE BE ON TIME! • WALK-INs / STAND-BYs: Individuals who have not pre-registered and who do not have a ticket will only be admitted IF seats are available AFTER the start time for the event. While we cannot guarantee a seat, we will try our best to accommodate those who arrive BEFORE the start time. For those walk-ins attending the Inclusionary Zoning Orientation, please sign the Stand-By Sheet, which is available at the intake window, to let us know you are waiting. Names will be called from the Stand-By Sheet in the order of arrival. Once all seats are occupied, those still waiting will be notified that the doors are closed and these individuals will need to register for another date. • LATE ARRIVALS: Please arrive on time as late arrivals may not be admitted. For those attending the Inclusionary Zoning Orientation, because the Inclusionary Zoning regulations REQUIRE that participants be certified as having fully participated in the IZO, nobody will be admitted more than 15 minutes after the start time of the event. If you arrive more than 15 minutes late, you will be asked to re-register for another date. There are no exceptions to this rule as regulation requires certification of FULL participation. To register for a Foreclosure Prevention Clinic or to schedule a one-on-one counseling session please call the Foreclosure Prevention hotline at 202-265-2255. Clinics are held at our Adams Morgan location every Wednesday and by appointment only on Thursdays at our Housing Empowerment Center at the Antioch Baptist Church of Deanwood. Our clinics include a presentation on vital information that every homeowner in danger of foreclosure should know. Attendees are then scheduled to meet individually with counselors who will address their specific situations. Some appointments are available on the same day. Please be sure to bring all related documents to the clinic because you may be scheduled for an individual appointment immediately following the clinic. For a list of required documents see our Document Check List at the “Download Center“ on this website. The Rental Housing Search clinic provides helpful information to individuals and families searching for rental housing in Washington DC. Topics include resources for locating housing in Washington, D.C., how to best present yourself to a landlord during the rental application process, determining how much you can afford to pay in rent, financial assistance, and subsidized housing for renters in Washington, D.C. Please note that HCS does NOT place participants in housing and does NOT have housing units to rent. Inclusionary Zoning Program Orientation (11:00 AM) - FULL - Not accepting new registrations. Inclusionary Zoning Program Orientation (2:00 PM) - FULL - Not accepting new registrations. Inclusionary Zoning Program Orientation (6:00pm) - FULL - Not accepting new registrations. This is a free money management and financial literacy workshop on budgeting and credit to help participants achieve their financial goals (including eventual home purchase). Topics include analyzing your finances and working with a budget, understanding and improving your credit, predatory lending and identity theft. This workshop is held on the 2nd Wednesday of each month at 6:00 p.m. The Pre-Purchase Orientation is a 2-hour introductory workshop to educate home buyers on topics critical to purchasing a home, including; determining whether you are ready to buy and preparing for home purchase (considering your income, debt, credit, savings, and other factors), an overview of the home purchase process, understanding home loans, home purchase programs (including HPAP and EAHP), tax relief for home buyers, the Inclusionary Zoning (IZ) and Affordable Dwelling Unit programs, predatory lending and housing discrimination. People who determine that they are ready to apply for the HPAP and/or EAHP program will receive specific instructions on how to submit an application either independently or with the help of a counselor. Clients who would like help dealing with credit or financial obstacles to home purchase are encouraged to schedule a Money/Credit or Pre-Purchase counseling session before applying for financing. A workshop to educate home buyers on topics critical to purchasing a home, including; determining whether you are ready to buy and preparing for home purchase (considering your income, debt, credit, savings, and other factors), an overview of the home purchase process, understanding home loans, home purchase programs (including HPAP and EAHP), tax relief for home buyers, the Inclusionary Zoning (IZ) and Affordable Dwelling Unit programs, predatory lending and housing discrimination. People who determine that they are ready to apply for the HPAP and/or EAHP program will receive specific instructions on how to submit an application either independently or with the help of a counselor. Clients who would like help dealing with credit or financial obstacles to home purchase are encouraged to schedule a Money/Credit or Pre-Purchase counseling session before applying for financing. Do you want to learn about reverse mortgages without hearing the hard sales pitch? This workshop is conducted by a HUD approved reverse mortgage (Home Equity Conversion Mortgage) counselor who will tell you the pros and cons of a reverse mortgage. The workshop is free and open to residents of DC, Maryland, and Virginia. Already have a reverse mortgage or know someone who does? This workshop will help to reacquaint you with the details of how a reverse mortgage affects your finances and your loved ones. The DC Department of Housing and Community Development (DHCD) provides grants and loans, not to exceed a total of $75,000, to help DC homeowners finance home repairs that will correct building code violations, remove barriers to accessibility for persons with physical impairments, and remove threats to health and safety in their homes including roof repairs and lead-based paint hazards. Learn how to apply and about the SFRRP process at this free orientation. Learn how to protect and improve your credit and review your credit report with a housing counselor. 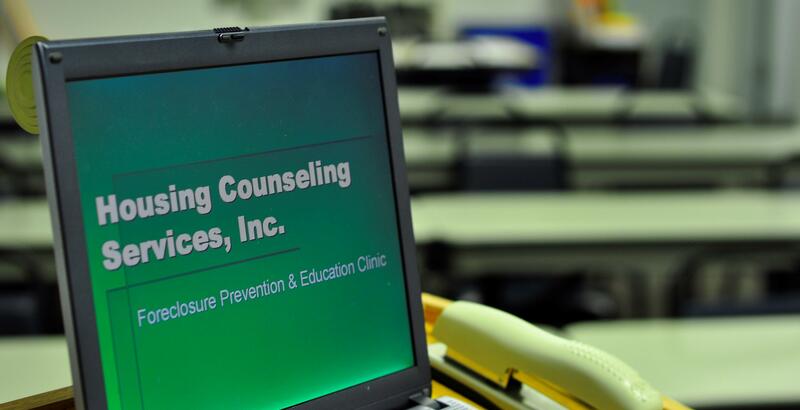 HCS provides free credit counseling but there is a nominal charge if we pull your credit report. Ask about pricing when you register. Registration is required, call 202-667-7606.